Serve this yummy Peanut Butter Chocolate Chip Cookie Dip at your next party. It’s perfect for dessert. I participated in this event on behalf of Wendy’s Bloggers. I received Loacker products to facilitate my post, but the recipe, opinions, photos and creative content are my own. Who said dips have to be savory? I have a real treat to share with you today, my friends. This Peanut Butter Chocolate Chip Cookie Dip is the perfect sweet ending dessert dip to serve at your next party. If you are a fan of cookie batter and licking the bowl (slowly raise hand), then you need to make this delicious dip! I like to serve this dip with Loacker wafers. I am a big fan of their wafers and chocolate confections. If you remember, I shared a delicious Eggnog Cheesecake Parfait recipe with you last month. You’ll want to check that delicious recipe out too. Loacker has been making quality wafers and chocolate confections since 1925. This Italian-based company prides itself on creating pure and wholesome confections. Loacker is made with love, craftsmanship and only the finest ingredients, deep in the heart of the Dolomites. Want to try some Loacker products? Be sure to enter the giveaway below for a chance to WIN!! They have a variety of delicious wafers and chocolate confections available. Be sure to check out their selection at your local supermarket. Now let’s get dipping! 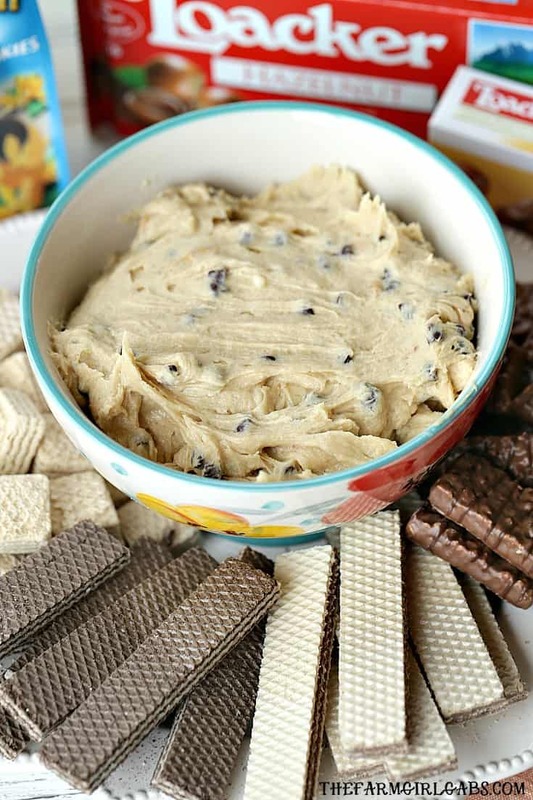 This Peanut Butter Chocolate Chip Cookie Dip is super simple to make. Basically, this recipe is just like the cookie version of a peanut butter chocolate chip cookie, minus the eggs and baking time! Just like you would a cookie batter, beat the butter, peanut butter, cream cheese, and sugars together with a hand mixer until smooth. Stir in the chocolate chips and peanut butter chips. I like to serve my Peanut Butter Chocolate Chip Cookie Dip with a selection of Loacker wafers. My kids love their wafer varieties. I usually have to hide them in the pantry so they don’t eat them all. This dip is best at room temperature. But make sure your refrigerate if you prepare it in advance. 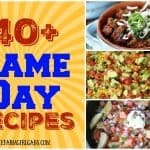 Love my recipe? Visit #LoackerLove for other great Loacker-inspired recipes. Stay connected with LoackerUSA on Facebook, Twitter, Pinterest, and Instagram. And be sure to enroll in Loacker’s Insider Loyalty Program to start earning free Loacker treats today! If you are a fan of cookie dough, you will love this dip! Peanut butter and chocolate flavors are a match made in heaven. They pair so well together. When you serve this recipe, your guests will be dipping as fast as they can before it’s all gone. But Wait! There’s More!!! Enter the giveaway below for a chance to win Loacker Products to serve with your Peanut Butter Chocolate Chip Cookie Dip! Serve this yummy Peanut Butter Chocolate Chip Cookie Dip at your next party. It's perfect for dessert. In a medium bowl beat peanut butter, butter and cream cheese until smooth. Mix in sugars and vanilla. Beat until combined. Use a spatula to stir in chocolate and peanut butter chips. My all-time favorite dessert is definitely German chocolate cake! I’m not even German, but I love it! I love pretty much anything that has chocolate in it!